Once you have done working with published SQL databases, you may want to unpublish (detach) these databases from the target SQL server. Upon closing the Veeam Explorer console, all the published databases will be detached from the target SQL server automatically. The corresponding mount points will also be dismounted from under the C:\VeeamFLR directory. On manual unpublishing, databases will be detached at once but the restore point will remain mounted on a target machine for the next 15 minutes. 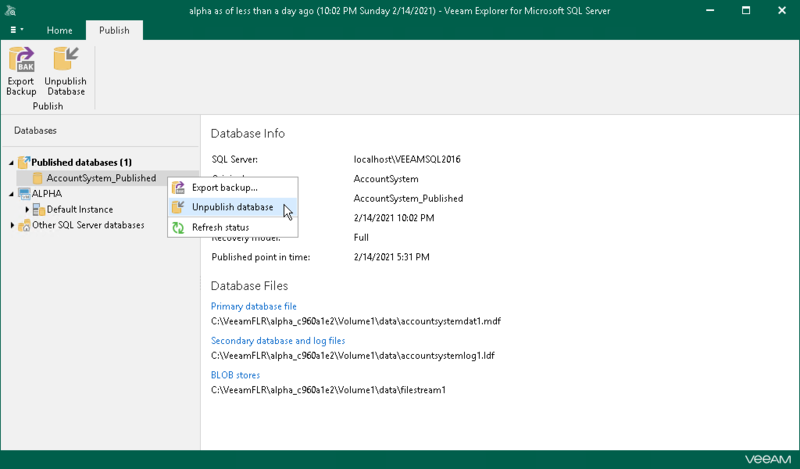 In the navigation pane, under the Published databases node, select a published database. On the Publish tab, select Unpublish Database or right-click a database and select Unpublish database. You can detach a single published database or all databases altogether by right-clicking the root Published databases node and selecting Unpublish databases or by using the Unpublish Databases command on the Publish tab.